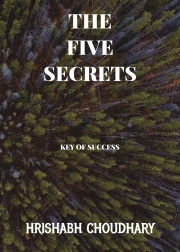 Description of "THE FIVE SECRETS"
peace in relationships — peace in the world. present-centered practice Inspired by the Now. being for — giving and receiving Wisdom. HRISHABH IS A HIGH SPIRITED YOUNG ARTIST. BORN AND BROUGHT UP IN THE SMALL WEST BENGAL TOWN SILIGURI, HE IS A SECOND YEAR COLLEGE STUDENT OF ECONOMICS HONOURS. HE HAS WRITTEN SOME ARTICLES AND SHORT STORIES. BESIDES WRITING, HE HAS KEEN INTEREST IN ART AND MUSIC. Reviews of "THE FIVE SECRETS"